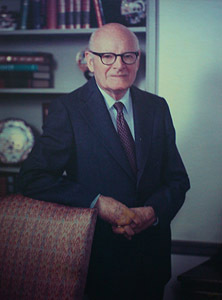 The laboratory proudly carries the name of Merlin Trumbull, MD, a pioneer in diagnostic medicine. In 1947 Dr. Trumbull moved to Memphis and quickly developed a sterling reputation for his excellent diagnostic and interpretive skills. This reputation enabled him to attract outstanding pathologists and build the practice known today as Pathology Group of the MidSouth. With this rich legacy the PGM/Trumbull team has been able to: customize courier pick-up; enhance pathology reports; reduce turn-around-time for results; employ the very best technologists, technicians and support personnel; invest in state-of-the-art technology and instrumentation; support clients with dedicated Client Services and Sales representatives; and ultimately raise the standard for anatomic laboratory services in the MidSouth. These efforts were recently rewarded when the College of American Pathology's rigorous on-site inspection resulted in accreditation and national recognition for the "excellence of the services being provided." But the real test of PGM/Trumbull's service is its ability to provide accurate and definitive diagnostic results to clinicians as quickly as possible; a proven ability that is motivated by keen awareness of the concerned clinician and anxious patient behind each specimen. In an age of rising costs, competition and managed care, front-end communication links between pathologists and clinicians can shorten time spent on determining diagnoses, thereby accelerating treatments and saving money, PGM/Trumbull is well positioned to advise on appropriate laboratory utilization and to render expert diagnostic interpretations in order to facilitate the implementation of effective and efficient treatment protocols.